Your deck could be a favorite spot of the home for you and your family. It’s a great place to relax and entertain guests, especially during the warmer months. But since decks are exposed to the elements and constant foot traffic, the majority of them require a good deal of maintenance for aesthetic purposes. One way homeowners keep their decks protected and beautiful is with routine staining. 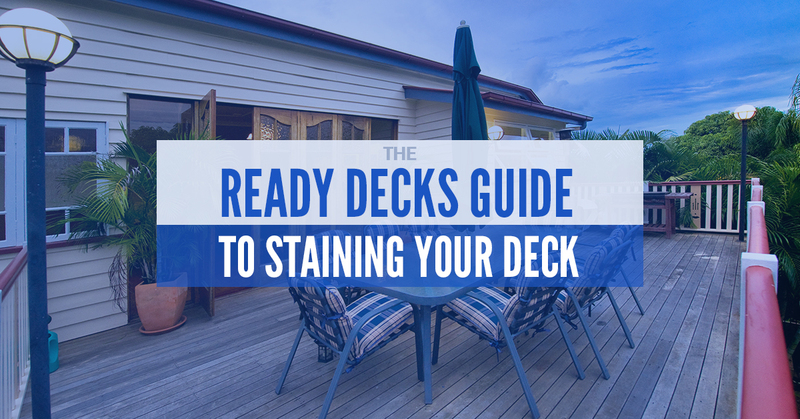 In this blog post, we will share our tips for properly staining your deck and provide more information about affordable decks from Ready Decks. We touched on this a bit in ‘How to Make that Old Deck Look Like New.’ For best results, be sure that the wood is dry and free of contaminants. A stain that’s applied to damp surfaces of a deck won’t adhere well and can even crack or peel. If you’re taking the time to stain your deck, it’s imperative that you properly clean and prep it. Avoid staining your deck in extreme hot or cold temperatures. Don’t forget to take a look at the extended forecast either, as you shouldn’t apply stain if rain is expected over the next 12-24 hours. As opposed to staining the whole deck at once without looking at the result, test a small area first. Do you have a large deck? If that’s the case and you need multiple gallons of stain for the project, mix them together to ensure color consistency. Using natural bristle brushes, heavily coat the open end-grain of the boards. Then brush several boards at a time, from one end to the other in smooth, long strokes. On newer decks, apply just one coat of oil-based deck finish. If your decking is made from recycled plastic materials and wood, remember to follow the manufacturer’s instructions. Depending on the stain you use, you’ll need to reapply it regularly. Cabot recommends that if the stain is still repelling water, it’s still doing its job. Since 2001, Ready Decks has been the leader in providing the highest quality site-built decks in the shortest time possible while offering homeowners the most value. That mission, unchanged through the years, is why we’ve already had more than 15,000 satisfied customers across multiple locations. Our outdoor deck builders take advantage of a patent-pending tools, equipment, and construction process invented by Ready Decks to ensure the best customer experience. Not to mention, our reliable deck installers complete the majority of projects in one day, whereas most deck contractors and decking companies require multiple days. Homeowners can feel comfortable knowing that Ready Decks uses premium-grade, treated lumber. The quality products don’t stop there, though, as we are proud to use only ACQ-approved ring-shank fasteners designed specifically for strength, durability, and strength. Along with the quality and value comes an emphasis on integrity. The local deck builders at Ready Decks back every deck built with a lifetime limited warranty, so there’s no reason to worry that your deck will break down. With high-quality, affordable decks as the backbone of our business, see what our deck contractors can do for your family. Find a location today and be sure to ask about financing.